Creating a Quilt Show to celebrate the Centennial of Suffrage. My daughter and I are designing a quilt to celebrate the Centennial of Women's Suffrage. But when I looked for a show where we could exhibit our joint venture, I couldn't find one. Let's make a quilt show! Blogging here is my proof of officially getting started. Maybe you were thinking the same thing? Suffrage is good cause for a quilt. A centennial alone is a bonus reason to quilt. And a contest/show is a meaningful way to unite our projects, to craft together and share in each other's art. I so hope you will join! And what about the original quilts for women's suffrage? The one's our great grandmothers made to raffle and to illustrate their ideals. 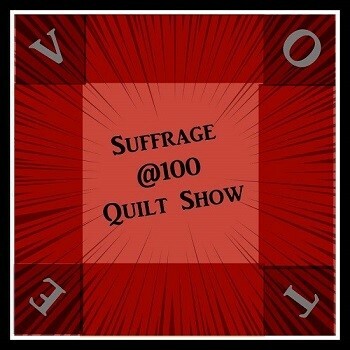 Do you have stories about Suffrage era quilting? Please comment here anytime you have resources or remembrances. Or just share what inspires you about commemorative quilting.